The win created Bulldogs history, with the side continuing undefeated throughout the entire season - a feat last achieved by Wests in 1989 - to win their third premiership title. The Kombes came into the match hoping to end the Bulldogs' unbeaten run, and gave a good account of themselves in the first half by restricting University to a 7-point half time lead. This blew out in the second half, as a fitter Bulldogs side led by Rex Leka, Tau Morove and Brendan Lulubo took control of the match and sparked a 9-goal scoring spree to put the game out of Wests' reach. With champion half-forward John Mondo missing Wests were left with few forward options. This was compounded by a soild performance from Bulldogs defenders Bruce Tendawai and Junior KMB who effectively rebounded Kombe kicks out of defensive 50. The same was not true at the other end of the ground, where Wests' Nick Apamumu played well at full back but was not enough to prevent University's potent forwards Lulubo, Leka and Dominic Luvuana from winning the ball time after time. Lulubo was named best and fairest player in the final, finishing narrowly ahead of Wests' Peter Keu who was outstanding for the losers. The thrashing was the third Grand Final loss in a row for Wests, who succumbed last year to a more talented Kelloggs-KDC Dockers side. They will need to develop better match fitness if they hope to overcome the younger, fitter University side next year and finally take home the trophy. The reserves Grand Final witnessed a similar result to the seniors, with the Bulldogs running out winners over Wests. University's Steven Ila was best on ground. 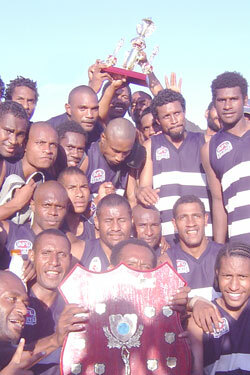 Port Moresby defeated Wests in the Under 20 Grand Final, making the day 0-3 for the West New Britain side. An article byThe National's Ekonia Peni has more information on the final.